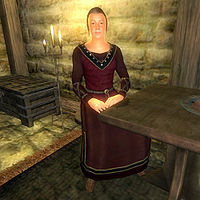 Eyja is a Nord commoner who lives in Skingrad. Initially she lives and works at Colovian Traders near her employer Gunder but after you purchase the Servant's Quarters upgrade for Rosethorn Hall she will offer to become your servant on the condition that she can reside there, and that you pay her 150 gold. Hiring her starts and finishes a mini-quest called Helping Hands. Initially, Eyja will wander around Skingrad near the two guild halls between 6pm and 8pm and then eat at Two Sisters Lodge until 10pm. Apart from that she will walk around the store all day and night. After she moves into Rosethorn Hall, she sleeps in the basement from around midnight until 7am. At 9am she will spend three hours sitting on a stool near her bed in the basement. For the rest of the day she wanders around the main floor of the house. She wears a burgundy linen outfit of pants and shirt along with thick cowhide shoes. She also carries a few coins and a key to Colovian Traders, and will receive a copy of the key to Rosethorn Hall when she moves in. Once you purchase the Servant's Quarters upgrade, she will approach you with a polite "Excuse me..." When spoken to, she will say: "Hello, I heard you purchased the Servants Quarters for Rosethorn Hall, and I was wondering if you had anyone in mind to fill that position? For 150 gold and a roof over my head, I'm yours. Well, to help around the house I mean." If you refuse her offer, she will reply with: "Very well. If you change your mind, I'll be here." If you accept, she will delightedly say: "Excellent! I'll move in immediately!" If you speak to her before she moves in, she will reassure you with the words: "I'm on my way to Rosethorn Hall now. I won't be long." After she moves in, she will greet you with: "How can I be of service?" She will often wish you well as you pass, saying: "Good day/evening, milord/milady." When asked about herself, she will tell her story: "Me? There's not much to say. I was orphaned when I was young, and don't even remember who my parents were. I'm not really sad about it; it was so long ago. Gunder took me in when I was but a teen, and I've lived there ever since. We've... shared a bed... but were never married. He's never been cruel to me, it's just that he's never been kind. It's as if I'm just another part of his shop. But all that's different now. I'm glad to be serving you instead. I can see we will get along just fine!" There seems to be more than she is letting on, however, as when she knows she is leaving Gunder's service she will announce that she "Can't wait to get out of here." Once away from the store she is even more emphatic, saying "I can't wait... finally I'm away from that horrid store." Eyja has some useful culinary skills. Once the kitchen upgrade has been installed at Rosethorn Hall she can be asked for "Drink", to which she will respond "Certainly! Here you are. A nice mead will relax you." and hand over some Rosethorn Mead, or "Food" and will reply "Certainly! Here you are. Shepherd's Pie... my own recipe. ", handing over a Shepherd's Pie. Without the kitchen, she will reply that "I'd love to oblige, but we have no kitchen." Should you become a vampire Eyja will notice the difference, saying "Something seems... amiss with you, milord/milady." She will also express her concern if you contract a disease: "You don't appear well, milord/milady. Perhaps you should rest." At the start of the game, Eyja is supposed to sleep with Gunder from midnight until 6am but this doesn't happen because the bed is marked as being owned by Gunder. After moving into Rosethorn Hall, Eyja no longer eats. The time she spends sitting on her stool in the basement is intended to be her time for a meal (the AI package is called EyjaMaidEat but it is a "find" package rather than an "eat", so she sits and does nothing). This page was last modified on 9 October 2014, at 17:05.